SF State has formed a new Division of Equity & Community Inclusion office to improve the campus climate for all students and facilitate intercultural dialogue. San Francisco State University has formed a new division to promote equity and inclusion, advance social justice, improve the campus climate for all students and facilitate intercultural and intergroup dialogue. The Division of Equity & Community Inclusion will open its doors next week in time for the beginning of the new academic year. The office will work with student clubs and organizations and other campus partners to close the educational equity gap in support of the Graduation Initiative 2025, which seeks to raise retention and graduation rates, strengthen student learning and improve the student experience at all levels. Manuel Alejandro Pérez will serve as the interim assistant vice president for Equity & Community Inclusion beginning Sept. 13. He identifies as a queer Xicanx and is a native Spanish-speaker and Sacramento native who comes from a Mexican migrant and immigrant background. Pérez has committed over 15 years of service and work experience to different areas of higher education in California. He most recently served as the dean of Equity Programs and Pathways at American River College in Sacramento where he supported the efforts of equity, access and support services and programs for disproportionately impacted communities for more than eight years. 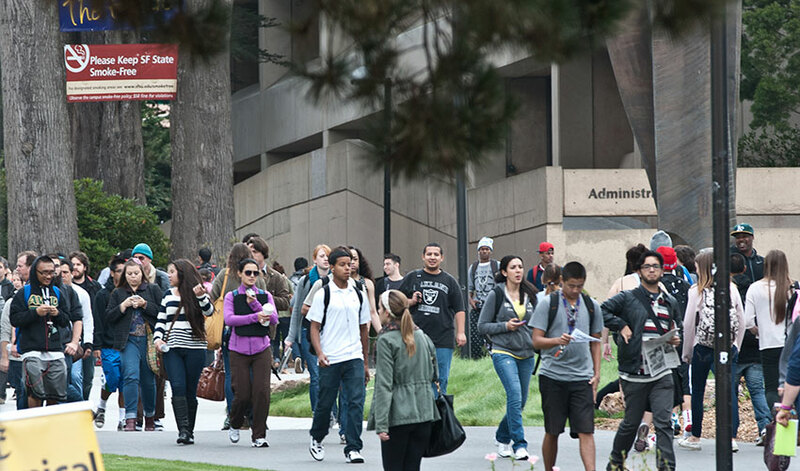 SF State plans to eventually conduct national searches to appoint a director of the new Black Unity Center and a director of the Office of Diversity & Student Equity. In the meantime, Associate Professor of Africana Studies Serie McDougal and Aimee Zenzele Barnes will serve as interim directors, respectively. Barnes has been interim executive director of Associated Students at SF State since 2014. The division will be housed in the first floor of Village C, across from the Office of International Programs. “This is a historic milestone for SF State, and the real work to bring about greater equity, inclusion and social justice on our campus is only just beginning,” Vice President for Student Affairs & Enrollment Management Luoluo Hong said. The Black Unity Center will host speakers and cultural events and will also offer academic support and career advising, McDougal said.